ProBE™ evaluates an organization’s new product performance on eight metrics. It also evaluates its new product practices in eleven factors-the critical success factors. 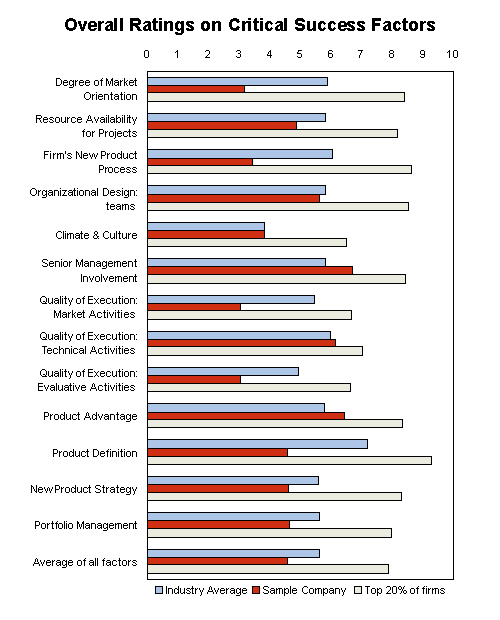 Over 100 characteristics of the new product program and its performance are measured. The evaluation will provide a clear understanding of how the organization compares to other firms. Identifies weaknesses and strengths in new products, and what needs to be fixed. Secures the active involvement and buy-in of key people in the company into the change or redesign process. Provides a broad base of comparison (ProBE™ is based on the widely praised NewProd™ series of research studies and brings together data from over 2,500 firms). Project Team Performance is assessed on a number of variables and compared to the industry average and the top 20% of firms.